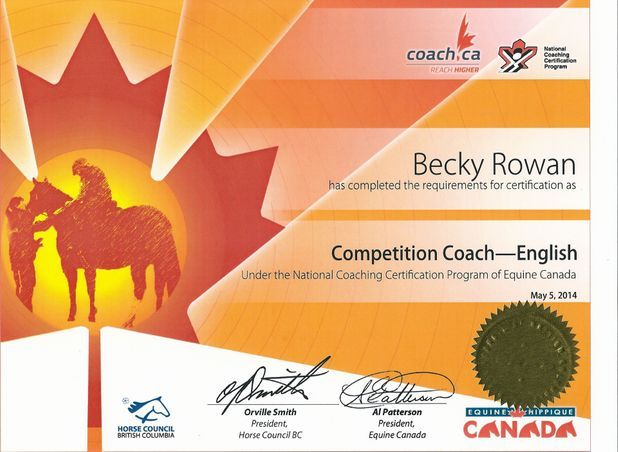 Becky Rowan is an Equine Canada Certified Competition Coach. She offers a coaching program dedicated to the positive development of riders of all ages and stages. Whether your goals are to compete in 3 day eventing, jumper, dressage or are strictly recreational. She can help you achieve your goals in a fun and safe environment. You can bring your horses to Richlands Sport Horses for lessons and Becky also travels to teach within the North Okanagan. Becky has been involved in the equestrian community for 25 year working mainly with OTTBs. She has produced and competed horses through to the intermediate level in Eventing and also spent a few years in Southern California working in an 'A' circuit hunter/jumper barn. She has ridden with Robin Hahn, Nick Holmes-Smith and Katie Berney to name a few.